Our mission is to create unforgettable events by exceeding your expectations with amazing food, warm welcoming service and creative presentation. Be a guest at your own event. A commitment to excellent food preparation. The blending of elegance, quality, service, flexibility and customization. Our assurance that we will pay attention to every detail to create a wonderful event and lasting impression. Our staff is trained with your guests in mind. They are courteous, neat, attentive and professional. Feel like a guest at your own event. Events from 50-300. We specialize in weddings, social affairs and corporate functions. We look forward to serving you at your next event. Be My Guest Catering was founded by Sandra Demilio in 2002. Sandra studied at the NCCA Culinary Apprenticeship in hospitality management, Hotel management, food services management and nutrition management Training in several top DC restaurants. Sandra worked as a sous chef at National Geographic, catering to large groups. She realized what she enjoyed most about food was the way it could transform the simplest of events into something special. BMG caters events of all types and sizes. Sandra's years of experience have made her an expert in guiding you to create the perfect event. Our catering team consists of kitchen, service, and sales professionals with over 500 years of culinary experience. 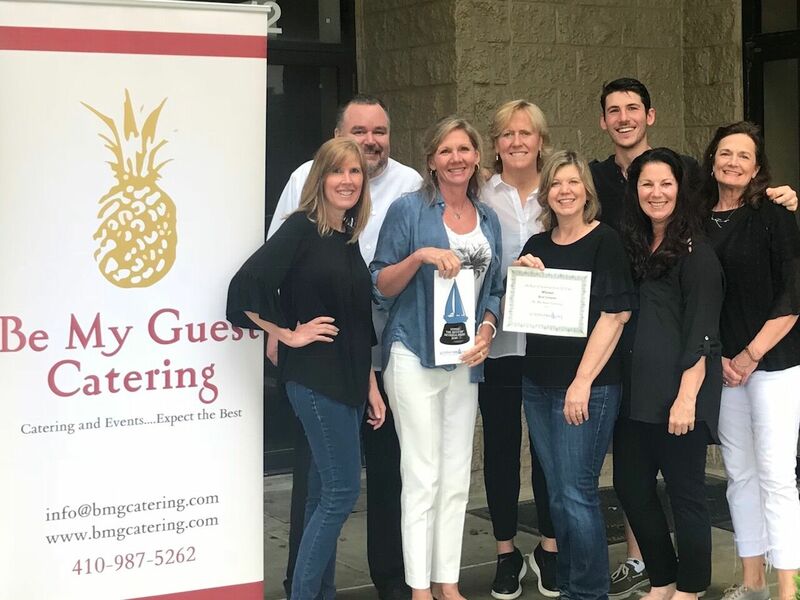 Our experience is only exceeded by our passion to serve amazing food create wonderful events, and build lasting relationships with our clients while giving back to our community. From the day we met Sandy (owner) she became an essential piece to our wedding. We needed someone who would work with our budget and large numbers. Sandy and her team exceed our needs and wants. Before we even hired Sandy she wanted to come see our venue, she talked directly with the manager at our venue and took care of all the paperwork for insurance etc. Sandy acted as a wedding planner for us. We talked to her like a friend throughout the entire planning time. The open and constant communication was so reassuring. I knew the day of my wedding would be as beautiful as I dreamed because BMG had been with me throughout appointments and meetings helping me to determine what would be best for our special day. Sandy helped us develop our timeline for the night, a task that sounds easy but is not. Be My Guest is more than catering, however their catering is as amazing as their customer service. Two weeks later our guest have still not stopped talking about the food. I will never forget walking into the venue and being greeted by Sandy and her staff, each of them smiled at me and complimented me. They were all so friendly, exactly the kind of people you want running the best day of your life. Before I even thought about it Sandy had a rain plan and everything worked out in case of any unplanned changes. As a bride, this is something you never want to deal with. Go with BMG, you will not be disappointed, you will only wish you could get married again so you could work with Sandy and her team one more time. Sandy and her team were amazing from the start to finish! Most importantly the food was yummy! They ensured everything turned out as planned and were able to flow with changes that needed to be made. Sandy was easy to get ahold of and always kept us informed on things we needed to complete prior to receiving them, menu decisions, table chart, etc. I would recommend Be My Guest for anyone wanting a non-traditional family style dinner, that turned out very good! We got married in December and cannot say enough good things about everyone at Be My Guest and the service that we received. From initial reach out, to the tasting experience, all the way through the reception, Sandy and the team made us feel like family. Not only was the food amazing (our guests continue to make comments), but Sandy helped us to organize rentals for our venue and came to multiple walkthroughs at our venue to help us select the proper lay out for our wedding reception. The Be My Guest team went the extra mile to make sure everything ran smoothly, and our wedding party could not have been happier when we received a plate of all of the appetizers delivered to our room prior to entering the cocktail hour. We would recommend Be My Guest to anyone that is looking for a wedding caterer. Sandy and her team exceeded our expectations. Their attention to detail, presentation, service and professionalism were exceptional. They took care of everything and there was no need for a wedding coordinator. The food was delicious and we’re still getting compliments on the food. I had family over the next day for brunch and Sandy took care of that as well. There were no leftovers! I look forward to using their services again. We decided to go with Be My Guest as they were highly recommended by our Venue ...and they did not disappoint. Their food was incredible and their service and staff were even better. They were informative and very helpful in planning for our reception; they certainly take on a larger role than just catering food. We were able to work out a unique and fun menu for our guests: chicken and waffles, carved beef and old bay potatoes, Mac-n-cheese station/bar, and more. We were told by so many newly-weds they were unable to eat during their wedding so we planned to have friends save a us a plate, but Be My Guest made sure to serve us each a plate with everything while guests received their food. Their service throughout the night couldn’t have been better and certainly makes for a stress-free evening. If you are looking for a caterer with amazing food and excellent service and friendly staff you should consider Be My Guest! © 2018, Be My Guest Catering, LLC. All Rights Reserved.